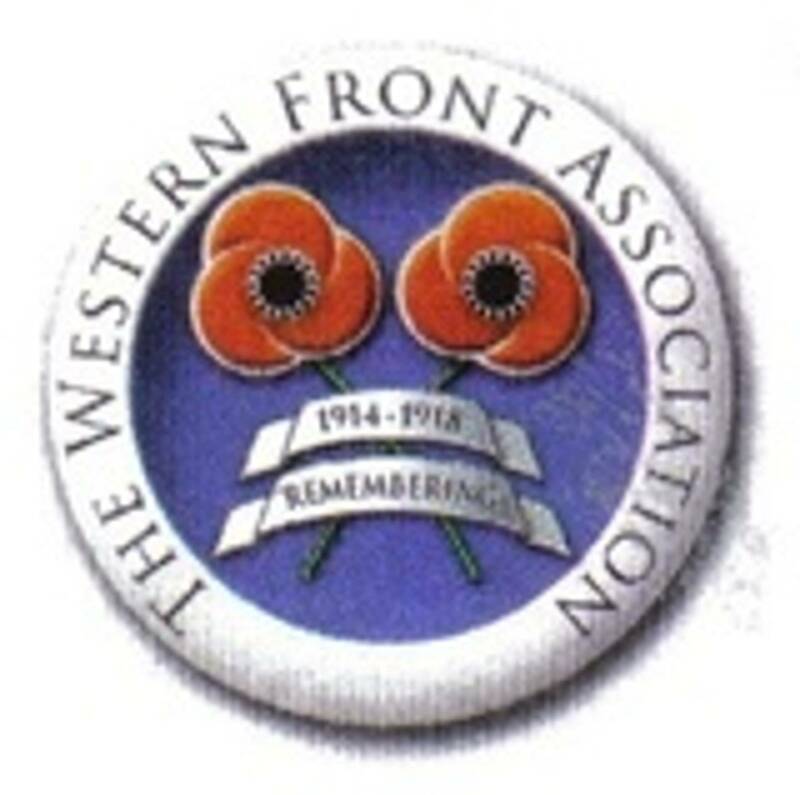 Dublin Western Front Association - 21 October, 1916/2016. Back To Our Past, 21 October, 2016. Killed In Action, 21 October, 1916. 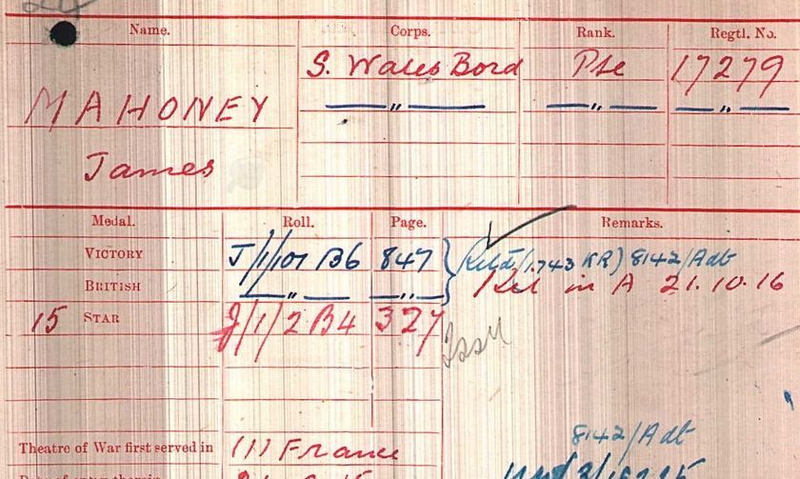 James Mahoney was born in Bandon, County Cork, he enlisted in the South Wales Borderers, in Merthyr, Glamorganshire, and was posted to the 6 Battalion, which had been formed at Brecon, on 12 September, 1914, as part of K3. By November, the battalion was stationed in Bournemouth, and the following February they were converted to a Pioneer battalion, (see note below). In April they moved to Hursley Park, near Winchester, and then onto Aldershot, from where in the early hours of September 23 they set out for France, arriving at Le Harve later the same day. The following months saw the battalion working at various locations on the Western Front, culminating in their arrival at the Battle of the Somme. It would seem that James body was never found, or if it was, was not identified, as he has no known grave and is remembered on the Thiepval Memorial to the Missing. James was entitled to the British War & Victory Medals and the 1914-15 Star. Pioneer battalions, created as an expedient in 1914, were a new concept in the British Army. Intended to provide the Royal Engineers, with skilled labour and to relieve the infantry from some of its non-combatant duties, Pioneers became the work horses of the Expedentiary Forces. The Coldstream Guards and over three dozen Country regiments, each created at least one pioneer battalion. These battalions wired, dug and reverted in all weathers and in all terrain. On many occasions they abandoned their working tools and fought alongside the infantry in repelling enemy attacks. In their efforts to stem the German offensives of 1918, several Pioneer units fought themselves to virtual annihilation. Often confused with the Pioneer Corps of the Second World War, the work of the Pioneer battalions has been largely ignored or misunderstood. Far from being the units of the aged and inform, these sixty-eight battalions played a major role in the Allied victory.